Volunteering abroad has a long and celebrated history as a rewarding way to make the most of your travels; or to take a break from the rigours of your day-to-day work and study. Seen by some as synonymous with holidaying, those who have invested their time, skills, and energy cite it as the hardest work you’ll ever enjoy. With volunteering opportunities opening up in ever-wider fields of activity, there’s never been a better time to take a look and see what you can do to make a difference. It doesn’t matter whether you’re sixteen, and just starting out, or have taken early retirement and are taking stock of all the spare time you now have – there’s something for everyone. Volunteering abroad used to be thought of as exclusively an activity for younger people. Taking a gap year to between school and university to volunteer is often a great opportunity for people; but these days a much wider range of people are getting involved. This growth has enabled both by a much wider range of projects, and by employers being willing and able to support their staff in taking time out to volunteer. Whether you plan to devote a week of your time, or take half a year out, you can make a real difference to people around the world. Volunteering has the potential to change not just your life, but those of people around the world. When you talk about spending your time abroad on a project, people can find it very easy to be dismissive, and to ask why you plan to bother with all that hard work; but the reality of it is that it doesn’t really take all that much work to just get out there and started, provided you do a little bit of planning. Volunteering is a transformational experience for many – providing inspiration and a sense of satisfaction that is hard to beat. Volunteering abroad brings you into contact with different cultures and languages, and in to situations that you will likely never have ever encountered before. As many people who have done this sort of work before will agree: engaging in a volunteer project will challenge you, inspire you, and frustrate you – often all in one day. So why do it if it is so difficult? The thing about volunteering with established organisations is that you will often gain access to places that you would otherwise never get anywhere near under normal circumstances. It might be areas of national parks that are off-limits, or to communities that have no transport links, but the sense of privilege and of doing something out of the ordinary will stay with you forever. In addition to that, volunteering equips you with new skills and experiences that you can then take with you and transfer to all sorts of future endeavours – be it as a volunteer elsewhere, or at work or in your home life. Confidence and the knowledge that you can, and have, achieved incredible things will give you the boost to apply yourself in new ways, and appreciate the things you have in new lights. There are both personal and professional benefits to you to volunteering. Don’t forget that you will rarely be travelling and working abroad on your own – and while the travelling friendships you strike up may feel frustratingly short-term its more often the case that you really get to know the people you will end up working with day-to-day. The shared experience of what can be intense work and situations with a community with limited resources will create friendships that are likely to survive time and distance afterwards. Even if you don’t travel with someone you already know from home, there are many gap year programs available that are designed to ease you into your new environments. These unique and often unlikely friendships will forge strong bounds as you rely on and work with each other. It is all part of the rich experience that makes volunteering abroad so much fun. One of the most often-cited benefits of volunteering on projects abroad is the sense of achieving a rare accomplishment. Unlike most office jobs, your work will be changing and enhancing people’s lives for the better. It isn’t uncommon for volunteers to find that this inspires them to take up new hobbies inspired by their work, to discover a passion for volunteering or to move to paid work in the charity sector as a long-term commitment. Above all, volunteering abroad leads to increased cultural sensitivity. Part of your training and learning experience will be to learn about the differing conversational customs, body language and common gestures in the countries where they will be working to reduce the chances of accidentally offending the people around them. The reflection we all feel when re-evaluating how our behaviour may be interpreted in different locations is fascinating, and indeed humbling when we consider how small changes make such huge differences in how we are perceived. On the professional side, the valuable and unusual experience you gain while volunteering adds elements that stand out on any CV – vital in the challenging and competitive job markets facing everyone. The networking opportunities that arise from meeting people of all ages and backgrounds around the world can often translate into professional connections to rival any personal ones you make; and the practical hands-on experience that you gain will equip you with skills valued by employers everywhere. These will range from the teamwork skills that you learn on your projects, working closely with diverse local and volunteer workers; and with the improved language skills that you will gain. If you are living and working abroad, there is no better way to improve your skills than with immersion in the local life and culture; while teaching English will develop your existing written and verbal skills as well. In addition, you will often learn management skills as your position will nearly always involve some element of it. Whether it is managing a large team or a smaller group of people, you will gain experience and skills that will better your career prospects another step. This can be a daunting and sometimes confusing element to consider – why should you pay money to volunteer your time? The thing to remember is that many volunteer positions will be with small community-based programs or with not-for-profit organisations that may likely not have the resources available to host and feed the people coming to help. When volunteering your time and money, you are paying for the costs that you incur while abroad – and these are the basic costs that everyone must pay – such as for entry visas, travel costs, meals and accommodation, vaccinations, background checks, and travel insurance. 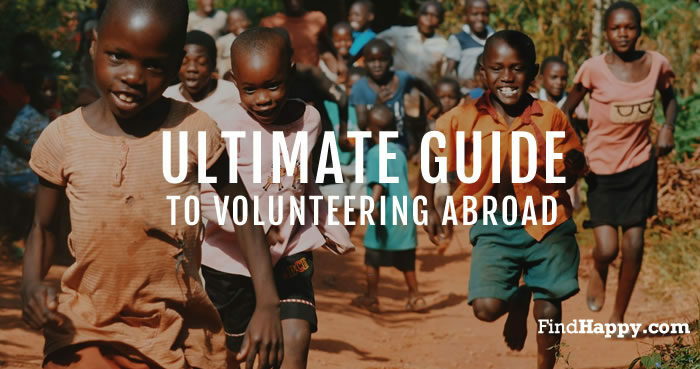 It is vital that if you want to volunteer abroad that you consider the likely costs. Volunteer agencies that offer opportunities will be able to provide a cost for those placements that covers much of the above, and of any training that may be required. Volunteer programs featuring community service or teaching are not as resource or training intensive as programs focused on marine or wildlife conservation for example; and the risks to which you are likely to be exposed will also be factored into the costs if game rangers are needed to accompany you, or if you need specialist training such as with SCUBA equipment. The biggest factor to consider should be the length of time that you are volunteering because that will need to include food and accommodation for the length of your placement. If you choose to travel independently, your cost of living will usually be calculated daily, whereas a travel company may provide a cost on a weekly basis. A different option may be to look at a volunteer service company. These companies look after all the details, allowing volunteers to focus on the work they have gone out to do. If there are problems, the company provides someone to resolve them. This is an expensive option as they will charge high fees for handling volunteer orientation and training, language training and 24/7 support and backup, along with options for weekend excursions away from the project, emergency precautions and occasionally lines of emergency credit. Less expensive service companies may provide these services in a more limited capacity. Then there is also the need to consider any incidental out of pocket expenses such as bottles of water and snacks while travelling as well as any curios, or local tourist excursions not included in the volunteer package. All in all, depending on the nature and duration of your volunteering project, you could expect to pay anywhere between £100-£1000 per week or more so it is vital to research, ahead of time, your likely expenses. You may wish to consider looking at fundraising ideas – several platforms exist to help crowd-fund fees and expenses for volunteering trips. In addition, volunteer scholarships may be offered by universities or employers. The logistics of travelling abroad to volunteer are very similar to those for travelling for a holiday. Once you know where you are going and when, you can begin working out what needs sorting out. The organisation that you are working with should be able to provide a check-list to work through, but some things are universal. At least six weeks before travelling – and for preference much sooner – you should make sure that your passport is current and will cover not only the entire duration of your stay but be valid for at least six months past your departure date. If you do not already have a passport, now is the time to apply for one. The process is simple and largely online, but it does still take time to complete. At the same time, you should also be checking to see if you need a visa – and if so what type of visa. Some countries offer tourist visas or have visa waiver arrangements, whereas others may require business visas or extensions of existing permissions for you to work as a volunteer. Plan your flights, and book them well in advance. Younger travellers may be able to take advantage of student or youth discounts, depending on the airline. There are several online services that will help you to compare discount rates and ticket prices to ensure that you get the best deal on travel. Many countries where volunteering projects are based require you to have proof of certain vaccinations before you are permitted to enter the country, or even to transfer through it. Any travel or health insurance you take out will also be dependent on your being vaccinated. You may also need to bring medications with you, like malaria prophylaxis, on your trip. Consult your doctor for more details and advice, because depending on where you are going you may need longer to allow the vaccinations to become effective before travelling. At least three weeks before travelling, make sure that your travel insurance is sorted out. Some programs will include insurance in their fees, but it is always a good idea to have cover in the event of a medical emergency or an evacuation, in the event of trip delays and baggage loss, or to protect any personal items like electronics that you may be bringing with you on your journey. It would be a good idea to consider registering with the local embassy – the GOV.UK website has comprehensive travel advice on travelling abroad and what to expect – and letting your bank know that you will be abroad. Doing so takes minutes in any branch or online, and eliminates the chances of your being asked extra security questions when you start buying things in a completely different country to where you normally live. You should also include considering reviewing your mobile phone usage, coverage and data plans. Most countries have reciprocal arrangements between providers but you may prefer to buy a cheap replacement locally while you are out there and leave your smart phone at home if you are going to be working in rugged conditions. You will want to travel reasonably lightly – try to limit yourself to one piece of main luggage and a personal bag for smaller items that you can carry on to a plane. Any toiletries should be travel-sized – you can restock while you are out there – and include basic first aid and medications. Essential electronics may include a portable battery bank, a flashlight, converters and a phone or e-reader. Other useful odds and ends may include a notebook and pen, a reusable water bottle and a quick dry towel. If you are staying with a host family, bring a gift – and don’t forget to ask the organisation you are working for if there are any simple donations that you can bring with you, like school supplies. What you may find difficult to prepare for though is your reaction to being immersed in a completely different country and culture. One way to prepare yourself is to read the stories of those who have volunteered before you. Videos and stories are widely available online, and there are a number of books by people who have volunteered for organisations like the Peace Corps available in book shops or in libraries. When you are looking for an organisation to work with, it is essential that you do your research. The volunteering industry is huge, and sadly some groups are more scrupulous than others. If you find a project that interests you, find out as much as you can about the company behind it – and check online reviews and forums. Talk to people who have worked on similar placements – reputable volunteering organisations will have no qualm about putting you in touch with previous participants. Research cultural norms – don’t wait for orientation – this will help with your packing decisions in terms of acceptable clothing if nothing else. Similarly think about the weather that you are likely to encounter at the time of year when you will be there. Above all, read, re-read, and read again the briefing. A project with rustic accommodation likely won’t have many showers or home comforts. Winter time in Northern Europe will not be to everyone’s taste when it comes to the weather. Make sure that your expectations are not wildly at variance with what is on offer. Why do you need a volunteer rather than employ someone locally? How is the local community involved in the project? Is there a local partner organisation, or does the organisation have a presence there too? What are the long-term goals of the project, and what is my role in making those come about? What will day-to-day life be like on the project? What support will there be locally or me? Orphanage Care – often working in childcare and youth development – children from disadvantaged backgrounds will be the primary focus of these projects. Volunteers will often be helping non-profit organisations who are highly underfunded. These projects are hugely rewarding but highly stressful. Community Building – usually based in rural areas, and often involving building structures, holding workshops and conducting medical missions. A hugely varied set of projects fall under this banner, coordinating with researchers, architects and officials from many organisations. Education – working with students of all ages and backgrounds from orphans to adults, teaching a wide array of subjects in a diverse number of settings such as community centres, clinics and academic institutions. Public Health Awareness – these programs often put volunteers in communities badly affected by health issues such as HIV/AIDS, teaching disease prevention and treatment and helping reduce the spread of illness. Volunteers may assist with seminars, provide treatment, and help deliver supplies. Wildlife and Marine Conservation – seen as adventurous opportunities to travel, these schemes are focused on caring for wildlife in a wide array of wild environments. Tasks may include surveys, rescuing animals and assisting researchers. Women’s Health, Welfare, and Rights – often located in rural areas or in protective shelters, this growing field helps women develop life skills and support them in setting up income-generating activities. Where local women are the victims of domestic violence, volunteers may help them overcome trauma and develop new coping techniques and skills to build their confidence and self-esteem. Multi-Country Volunteering – working and travelling between several locations and countries, conducting different work in each location. The work that you do as a volunteer abroad will continue long after you have left, as will the impact you make on the lives of those with whom you work. Good luck. So, you want to volunteer – but you’re not sure what kind of project you want to get involved in. Volunteering doesn’t have to be something done on a full-time basis – indeed most volunteers both here and abroad take the option of a part-time project around existing work commitments – but with an increasing number of organisations supporting employees by paying for them to have sabbatical time, or to claim volunteering days as paid leave in addition to any leave they may already have, a wider number of options have opened up for people of all ages, walks of life, and experience to get involved. If you’re looking for ideas, most local authorities around the UK have teams dedicated to helping people find local charities, and the national GOV.UK website has advice and links to regional bodies like Volunteering England, Volunteering Scotland, and Volunteering Wales which also detail opportunities in your area. The Green Gym Initiative is aimed at promoting health and relaxation for people around the UK by running regular exercise sessions disguised as conservation projects for local communities during the week day, or on weekend mornings. These are typically short-term projects lasting about half a day, run by experienced Green Gym Leaders. They guide volunteers through the session in a wide range of practical pieces of conservation activity. The sessions start with a series of warm-up exercises which are as much to do with reducing the risk of injuries as they are with burning calories; and the general tone and atmosphere is relaxed. The sessions are attended by all sorts of people, of all ages, and refreshments are included. Each session concludes with cool down exercises and a general tidy up. The general hope is that local volunteers eventually take over the management of their own group, and the organisation provides assistance and training towards that end. BTCV also run many more activities, both within the UK and internationally, with projects varying from building hiking trails in Iceland to working to coppice woodlands on the banks of the River Kennett. Typically offered as holidays where you participate in conservation activities, the BTCV usually has over 200 activities running every year. Blue Ventures are an internationally renowned conservation charity who work to protect marine biodiversity, especially where the ocean is vital to local cultures and economies. Their Belize Expeditions are based in the fishing village of Sarteneja and the Bacalar Chico Marine Reserve and involve working alongside science and dive professionals. The six-week expeditions include cultural exchanges sessions during home stays, as well as scientific and diving training. Working under water will require a PADI Advanced Open Water dive certificate, but the training available can take you up to Divemaster level if you are already an experienced diver. Once certified, you would be expected to carry out one or two dives a day to collect data, diving six days a week depending on the weather. Mellon Educate have been running an annual “building blitz” project in Africa for an international array of volunteers since their inception in 2002 by founder Niall Mellon. The focus of the blitz is to help poor African communities build better infrastructure. Their most recent work has been with the South African government to replace shanty town shack structures with high quality permanent homes, housing 125,000 people. They have also been working to improve access to education in African townships. By renovating existing schools and building twelve new schools (so far), an estimated ten thousand children have seen marked improvements in the educational resources available to them, giving them a better chance at life. The charity is continuing its work in developing educational programmes, aimed primarily at young children in Kenya and South Africa. Melon Educate are now advertising places on their next Blitz, which is due to take place between the 11th and 18th of November 2017. Last year saw 270 people signed up and over the course of seven days completed thirteen new classrooms, two toilet blocks, a kitchen, and renovated another seven buildings in the township of Khayelitsha in Cape Town. School grades as a result are reported to have risen massively, with many more children able to stay in school and attain good grades as a start in life. The brainchild of TV presenter, entrepreneur and world traveller Amar Latif, Traveleyes offer discounted holidays for volunteers in return for them using their eyes to share the experience with vision-impaired companions. These aren’t just sun, sea and sand holidays, with destination like Myan Mexico, Columbia and Tenerife hiking, there is something for everyone. As a Sighted Traveller, you act as a guide, describing the sights to a different person in the group with which you are on holiday. Up to fifty percent discount is on offer, and volunteers who have been on these trips report that their own memories of the events are more vivid than other holidays because they are stopping to think about and describe their environments using more than just their visual senses. Traveleyes send information packs to Sighted Travellers which include tips on how to guide, and tour managers also help with practical steps and questions along the way. Guiding is described as a mindful practice where you just describe what you see and how you see it – typically through a natural conversation. As you travel in a group, volunteers can also hear how other Sighted Travellers are describing things, further taking away stress about how to keep up. Raleigh International is a youth development charity primarily working with young people aged between 18 and 24. The aim of each of their projects is to help equip young people with the tools and skills they need to help themselves and their local communities. As a Volunteer Manager, you take on the role of managing younger people on those projects. Raleigh Expeditions usually last thirteen weeks, starting in January, June, July and September, with some eight-week Expeditions running in June and July. These regular expedition projects can range from providing clean and safe water to communities, helping to renovate public buildings such as schools, or doing conservation work – all prompted and guided by the needs of the local communities. As a manager, you will be working to motivate volunteers, and deliver the project’s goals. Two to six months may sound like a large chunk of your time, but if you are looking for a career break as an older volunteer and to get valuable qualifications as part of a Master degree programme, this is a grand adventure.